Image courtesy of Joel Luks. Did you know that tamales are not simply a delicious Mexican creation, but actually an ancient food staple? 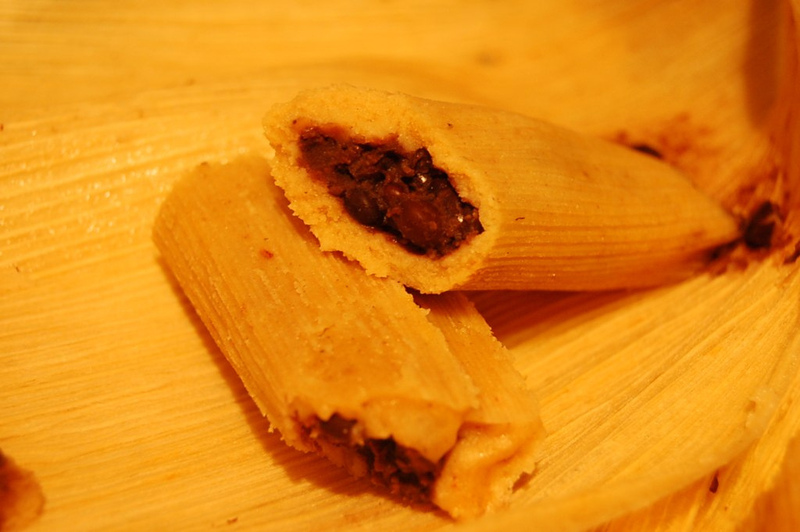 Created by the Aztecs using maize, their most important food, tamales were often filled with beans that were second only to maize in dietary importance. Other popular fillings included chilies, amaranth seeds, maize flowers, honey, beeswax, turkey, eggs and cherries. The following tamale recipe includes another link to the ancient past with the inclusion of the ingredient epazote. Also known as Mexican tea, the name comes from the Aztec (Nahuatl) epazotl. The Aztecs used it as both a culinary and a medicinal agent. It has a strong, distinctive flavor and is believed to reduce the digestive distress that sometimes accompanies the ingesting of beans. So as you mix the dough, add the epazote to the beans and assemble and steam your tamales, keep in mind you are following an ancient tradition. Cook up some Mayan hot chocolate for dessert and you’ll have a true pre-Columbian feast! *Recipe courtesy of Cathy Kaufman, Chairperson of the Culinary Historians of New York. Make the filling: Place the black beans, garlic, chili powder, dried chilies and epazote in a large pot and cover with fresh water by 2 inches. Bring to the boil and cook for one half hour. Add the 1 tablespoon salt and continue cooking until very tender. Drain. Transfer the solids to the work bowl of a food processor, add the tomatillos and coarsely chop. 1. Aguilar-Moreno, Manuel (2007). Handbook to Life in the Aztec World. Oxford and New York: Oxford University Press. pg. 372. This entry was posted in Blog, Bon Appetit Wednesday, Culinary, Culture and tagged ancient food, ancient history, AntiquityNOW, Aztecs, black beans, Bon Appetit Wednesday, epazote, maize, Mexican food, tamales. Bookmark the permalink. I’ve never made tamales with beans, but this sounds fantastic! I have never had a tamale with black beans! Sounds delightful!